Pochuck Swamp, New Jersey; Great Swamp, NY; Clarendon Gorge, VT; James River, VA. Maine. One of these things is not like the other. 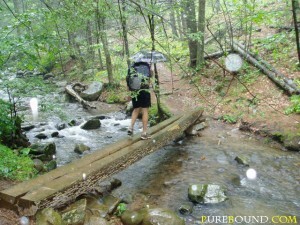 If you’ve hiked on the AT before, you may notice that it rains from time to time. The Smokies have some of the highest annual rainfall in the east. All that water needs to go somewhere, and much of it crosses the A.T. (or IS the A.T. in some cases). On all but 281 miles of the Trail, bridges are installed to cross most permanent streams, rivers and swamps. In Maine they use a canoe. What’s the deal? There’s a whole spectrum of structures designed and installed to help hikers get over the river (and the swamp). Countless miles of bog bridges (planks on supporting timbers; puncheon (split logs on other logs); untold numbers of smaller bridges using all manner of support structures; and the big, iconic structures mentioned in the lead can all be called “bridges”. And of course the AT make use of a number of usefully located automobile bridges as well. Let’s start with the most basic ways to address soggy trail, and work our way up in complexity (and regulation). 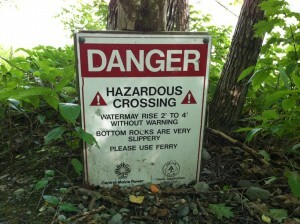 Some of you who have hiked on New England trails may have come across some “corduroy”. That is, small logs placed next to each other across the trail over muddy areas. The logs vary between about 3 and 6 inches in diameter, and they are usually just laid in the mud. Predictably, their lifespan is short, sinking out of sight or rotting into the ground fairly quickly. They are also slippery as hell. I don’t think you’ll find much corduroy on the A.T. any more, it just doesn’t have what it takes to survive that kind of traffic. The next simplest option is to cut down some nearby trees (12-18” in diameter, and out of sight of hikers), cut the trunks up into about 8ft lengths, peel the bark off and split them long ways into half-rounds with a chainsaw (this can be done by hand instead–if you have all summer). 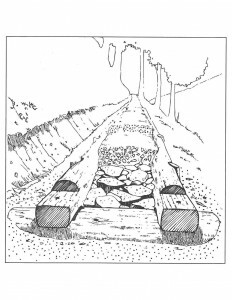 The split logs (called puncheon) are placed flat side up and notched and spiked into shorter cross-logs to hold the longer ones (and hikers) up above the mud. The same thing can be done with regular dressed lumber to create bog bridges. This material must be carried into the site. Both these variants can also be slippery as hell. Bog bridges and puncheon can last a fairly long time. Longevity factors are things like what species of wood is used, how wet the area is, and how much sunlight they are exposed to and the frequency of wet/dry cycles. If native materials are taken on site, one must also take into account whether the replacement cycle of the puncheon will out strip the available supply of trees over a given span of time. For the longest lasting structure, one might think that something like pressure-treated lumber might be the best choice. Or we could use manufactured decking products like Trex™. There are a couple of issues with this approach. Pressure treated lumber (PT) tends to dry out and split apart when exposed to sunlight or many wet/dry cycles (think about that shabby deck behind your neighbor’s house). Additionally, to be rot resistant, PT lumber is treated with poison to deter the bugs and other critters. Introducing poison into the Trail ecosystem may not be desirable. Manufactured lumber such as Trex, is not poisonous, but it’s also not particularly strong, so more stuff is needed to span the same section of Trail. Esthetically, neither material is something that looks very natural, and 500ft of straight, dressed lumber from Home Depot is probably not the way to promote a sense of remoteness from the outside world. Finally, both PT and Trex-like products are more or less permanent–that is to say when we are done with them (either because they wear out, or break, or the water table changes and they are no longer needed), we’re stuck with them. They won’t rot away, they have to be carried out and disposed of in a landfill. The plastic eventually ends up in an ocean someplace. An alternative is rough-cut lumber from a rot resistant species of wood such as Larch (aka Tamarack), Cedar or Black Locust. While still clearly not taken directly from the adjacent landscape, the rough finish and more natural shape of the planks is considerably less visually jarring (IMO). Rough cut lumber is also somewhat less than hellishly slippery. Regardless of the species, any non-manufactured wood will eventually rot and need to be replaced. 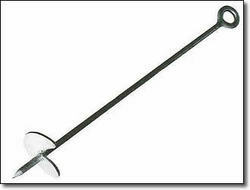 So, what’s a more long lasting alternative for spanning those pesky mud holes? Rock it. 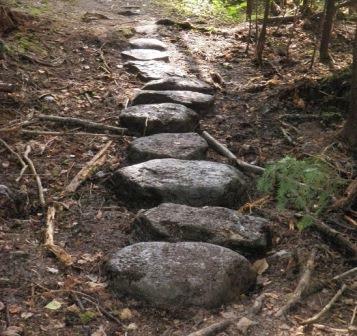 Rock stepping stones can be placed at close intervals in the mud. But this needs to be carefully done. Ever come across step stones that seem to have been placed by the nearest NBA team? Putting stones more than a foot apart is pretty useless for hikers with packs on. The same goes for stones that aren’t flat on the top, or aren’t firmly set. What’s the point of having them if you’re just going to slip off of them into the mud anyway? Another way to use rock is to crush it into gravel and pile it up to create a raised area above the mud. 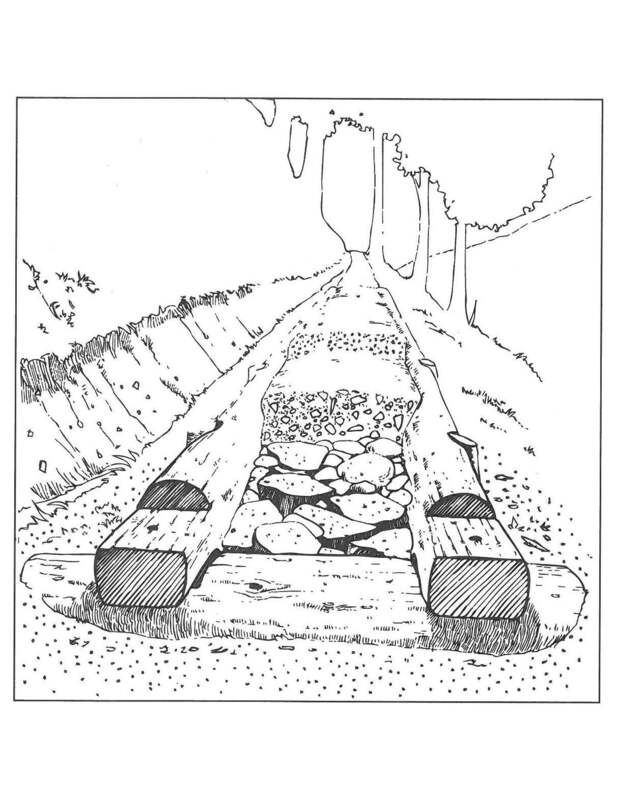 This ‘turnpike’ must be supported along the sides by logs or large stones to form a causeway through the wet area. Because the water drains through the crushed stone quickly, and it does not rot, a well made turnpike will last for decades. Besides, nothing is more fun for teen trail crews than smashing up big rocks into little rocks with a sledgehammer. So, let’s pause here and think about why we even need to worry about wet trail in the first place. You’re hiking outside, do you really expect to have clean, dry feet? What’s a more primitive experience than slogging through the mud? But in reality, everyone skirts around wet, boggy areas, perhaps from the misguided idea that they are doing less damage than just walking straight through–or what’s more likely, they just don’t want heavy muddy feet for the next mile, or have to deal with cleaning things up at the end of the day. However, damage to the footpath is greater when people skirt the edges of the mud hole, it kills the vegetation at the edge of the treadway, thus widening the trail and increasing its impact on the landscape. In really big wet areas, like Pochuck NJ, there is simply no way to cross without getting stuck in the mud and roots (that’s why it was a road walk for decades before the boardwalk was built). So much for relatively small areas that are either permanently or intermittently wet, but have no standing water, running channel, or stream. Where there is an actual body of water, or an extensive swamp, we need to step up our game. For large areas, where there are no available streambanks or edges to rest a bridge on, we drive ground anchors or helical piles (big screws twisted into the earth) and use them as the foundation for the boardwalk. The soft ground can be surprisingly deep. At Thundering Falls in Vermont, helical piles were driven as deep as 90 feet by a specialized machine before encountering enough resistance to support the walkway. Installations like this are serious construction projects, and may be well beyond the capability of local volunteer crews. Additionally, bridges and boardwalks must pass a review by professional engineers, and conform to standards set by the US Forest Service. This often results in extremely sturdy structures that are capable of carrying many trail visitors at the same time, including those who may be using motorized wheelchairs or other assistive devices. Fortunately, most are in “front country”, valley locations where the materials and machinery required to build them can be relatively easily transported to the work site. Moving on to more traditional bridges–ones that span a stream or creek in one or more segments. 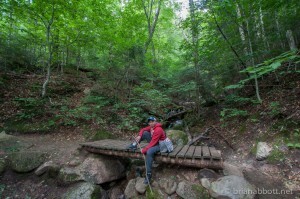 What’s the criteria for deciding whether to install a bridge or leave it to the hiker to ford the stream? Local Management Plans (LMP) start with ATC’s 2011 policy on stream crossings which in part calls for bridge construction or replacement only if the bridge “…is essential to hiker safety during the snow-free hiking season, recognizing that a stream may be unfordable when seasonal or regular flooding occurs.” or if “…it is absolutely necessary to protect sensitive resources, such as soils along a river’s bank.” So there’s the first two filters: hiker safety and resource protection. Reflecting on sections of Trail I’m familiar with, I’m not sure every bridge meets those criteria. Many may have been installed prior to the policy, and in other cases, the club believes resource damage would be extensive as hikers range up and down a stream bank looking for the best place to cross. Interestingly (to me, anyway), all of the physical elements of the Trail–including bridges of all kinds– measured and counted over the next three years. NPS is putting together the first ever comprehensive Trail-wide inventory of physical trail structures. 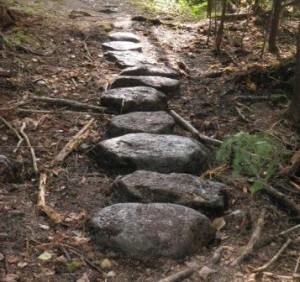 This will allow the Park Service to assign for the first time, a field-verified, dollar-per-mile value of the actual things that make up the Trail–which in turn will make the A.T. more competitive for Federal trails funding (in Government World, you don’t spend resources on something that doesn’t cost very much in the first place). Not every water crossing on the Trail in Maine will be fordable by every hiker, regardless of skill, at every normal water level. 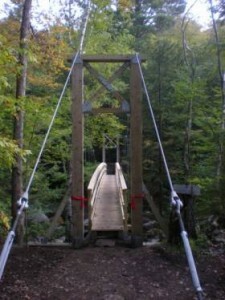 Bridges detract from the natural, wild-area character of the A.T. in Maine that distinguishes the hiking experience here from that along much of the rest of the Trail. The canoe ferry at the Kennebec began in 1987 after an A.T. hiker drowned attempting to ford the river. Unlike many rivers crossed by the Trail, the Kennebec has a dam and hydroelectric generation plant upstream. Water is released according to grid demand, and depth and speed can vary widely in a matter of a few minutes. 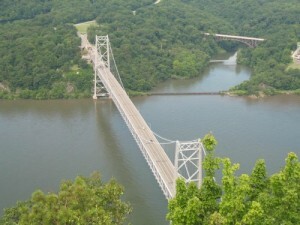 The nearest automobile bridge is many miles away from the trail. While there are hikers that do ford successfully, the vast majority choose the ferry. In 2014 1,902 hikers and 42 dogs made use of the service. There were 4 confirmed forders. Supporting the service is a considerable expense for ATC every year, but a bridge big enough to remain above the highest floods would be extremely large, and not in keeping with the minimalist ethic of the A.T. in Maine. Cost of construction and maintenance are also important considerations. Bridges that are more complex than a couple of logs across a small stream are significant undertakings. Major structures such as Clarendon or Big Branch in Vermont, are designed literally from the ground up (starting with reinforced abutments on each bank) by professional engineers, and are often installed by specialized contractors. 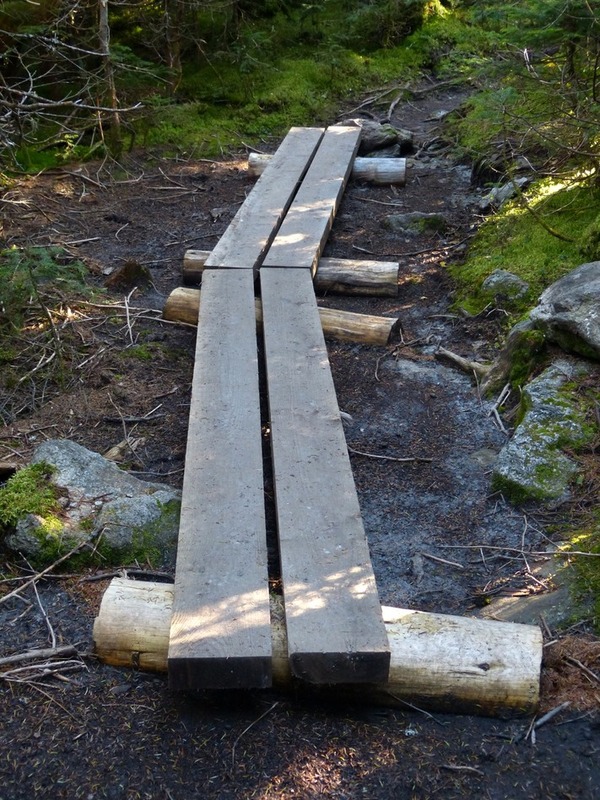 Since 2011, bridges built by trail clubs must use pre-approved structural designs or pass an engineering review. Like trail shelters, bridges can be an exciting and attractive project for volunteers, and satisfying (if only temporarily) to our “beaver gene”. They are also however, another thing that needs regular inspection, maintenance and eventual replacement–and peak flood events can wipe out decades of work in a few hours. While I don’t think there will be outright removal of existing bridges, many smaller ones may not be replaced as they age out over the next few decades. I enjoy trail bridges. Many have some unique construction or design details, and even the most modest ones provide a welcome event in my hiking day. The variety of solutions and the choices they represent are always interesting. The symbolic event of crossing something also in some way resonates with why I hike. 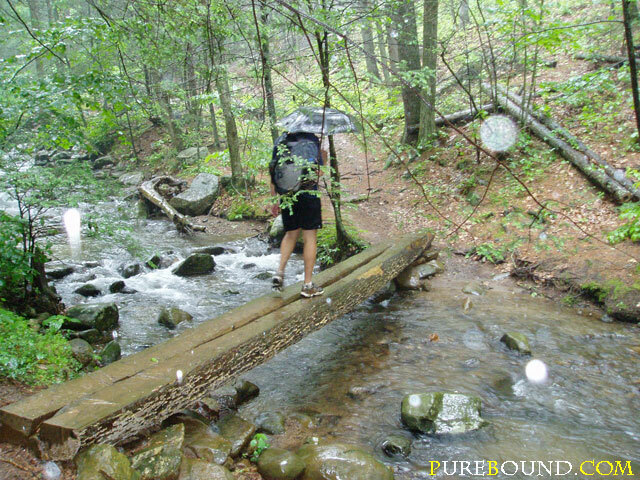 Several bridges along the Trail are indeed spectacular, spanning wild rivers that would be life threatening to cross, but most are modest structures, crafted minimally, with only the necessary materials to do the job. Even the lowly puncheon represents a trail club’s desire to protect the natural resources, and enhance the hiker’s journey. Hey, impossible as it seems I’m starting to run out of ideas for this space. If you have questions or would like me to present more info on the backstage world of the Trail, leave me a comment below. Related Reading: Check out the entire How the Appalachian Trail Works series. The better bog bridges I’ve seen here in the UK have wire mesh over the timber – makes a huge improvement to traction when it’s wet. Why does the trail in Vermont seem to be down in a trench below the surrounding land, effectively making the trail into a stream? Portions of the AT in VT and elsewhere in NE are sometimes on old ‘woods roads’ , which were worn down into the soil long before the AT. Being the lowest part of the surrounding land, they fill up quickly with every rain. I’m actually beginning a capstone project to wrap up my master in structural engineering and planned on designing a foot bridge to span over the Kennebec. I did not realize that Maine was so against river crossing, I just assumed that crossing were not in their budget. Thanks, I love your features!! Perhaps it would be interesting to hear about the re-routing of the trail. It’s so interesting to me that the trail can be different lengths in different years, I’d love to know more about the decision making that goes into that. Missed this one the first time around. Great post! It’s wonderful to see those who help decide these things sharing their thinking. It seems entirely arbitrary to far too many hikers, simply because they never get to see the sausage being made. You can see the party I was in crossing it. If you have very good balance, it’s possible to rock-hop when the water is lowest. The low camera angle disguises the amount of open water. It’s all like what you see close to the shore. In anything but the driest seasons, that is a very hazardous crossing, and it’s totally impassable in winter (it doesn’t freeze hard enough for skis or snowshoes to be safe) or snowmelt season. But even the safety argument is not enough to justify a construction project. What really convinced people that a bridge is a good idea is that West Stony Creek is one of only 10-20 well-preserved examples in New York State of riverside ice meadow. https://www.acris.nynhp.org/report.php?id=10009 It’s free of Lythrum salicaria, Phragmites australis, Fallopia japonica, and similar pests. 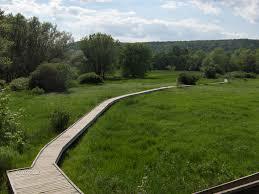 Otherwise rare species of sedges, jumiper, gentian, bluestem, and Indian-grass are found there. It’s a precious, isolated community. Sometime within the next couple of years, construction will start on a suspension bridge to lift the trail off the ice meadow and carry it about 100 feet over the river. It will be of the same general type and scale as seen in https://www.flickr.com/photos/ke9tv/albums/72157648479550550 . Ordinary water levels in West Stony Creek are comparable to those seen in the Sacandaga River in that picture. Like the bridge in the picture, it will most likely need a center tower, because the available trees will not yield timbers capable of supporting that long a run in a single span. 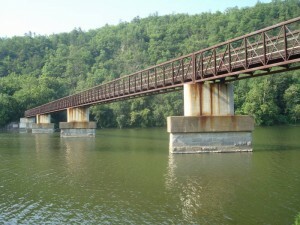 The river has a designation as a “wild and scenic river,” meaning that a bridge has to be constructed of native material except for fasteners. Fortunately for hikers and the riverbank alike, whatever agency regulates “wild and scenic rivers” decided to entertain the legal fiction that the suspension cables of the bridge are “fasteners.” A temporary sawmill can be erected on site, and there’s hemlock and tamarack aplenty for sawing the decking out of. If I understand correctly, there are a half-dozen Grand Old Men of the Forest that have been sacrificed so that their trunks can make the towers, and they are barked and up off the ground on piers so that the wood can season. That trail is in a very wet area, with a great many stream and bog crossings. The bridges range from beaver dams, to simple one- and two-log bridges, to extensive boardwalks (there’s one stretch with half a mile of puncheons supported on rafts), to barely credible funhouse structures like https://www.flickr.com/photos/ke9tv/18969654584 . Most of them are in magnificent disrepair, as suits an area being reclaimed by Nature. I don’t think it’s possible to thru-hike that trail without finding yourself waist-deep in beaver swamp at least once. 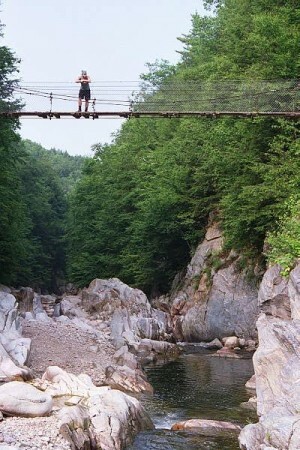 What can be done to create more bridges along the AT in New hampshire and Maine? 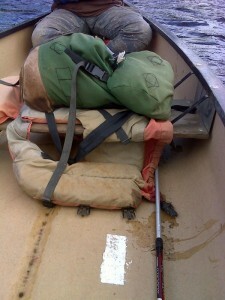 Sometimes the objective is not to “help” hikers, but to retain a measure of “wild” in the experience. Further, bridges are expensive to build and require consistent maintenance–particularly for longer spans. In New Hampshire, getting bridges high enough to avoid spring flooding and ice makes them even larger. 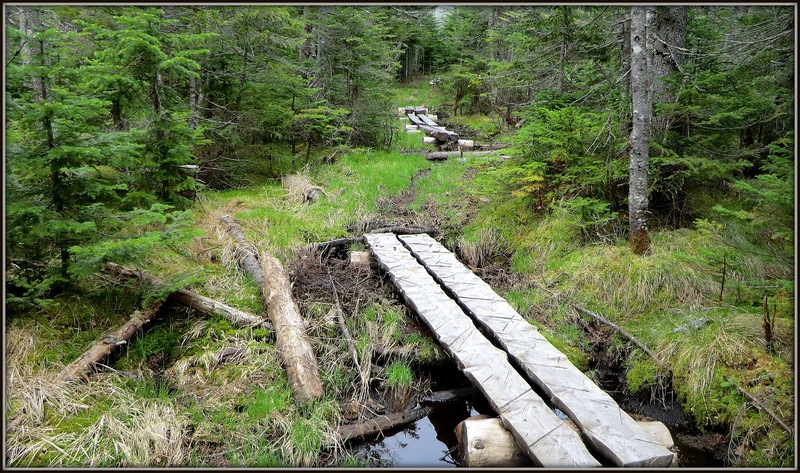 In Maine, it is the policy of the maintaining club (Maine Appalachian Trail Club) not to construct bridges, believing that fording streams is appropriate for backcountry travel, and acknowledging that hikers will need to use their own judgement regarding their personal safety. The ferry at the Kennebeck was only initiated after a hiker was drowned trying to ford this challenging stream, which is both wide and subject to unpredictable changes in water flow due to hydro dams upstream.